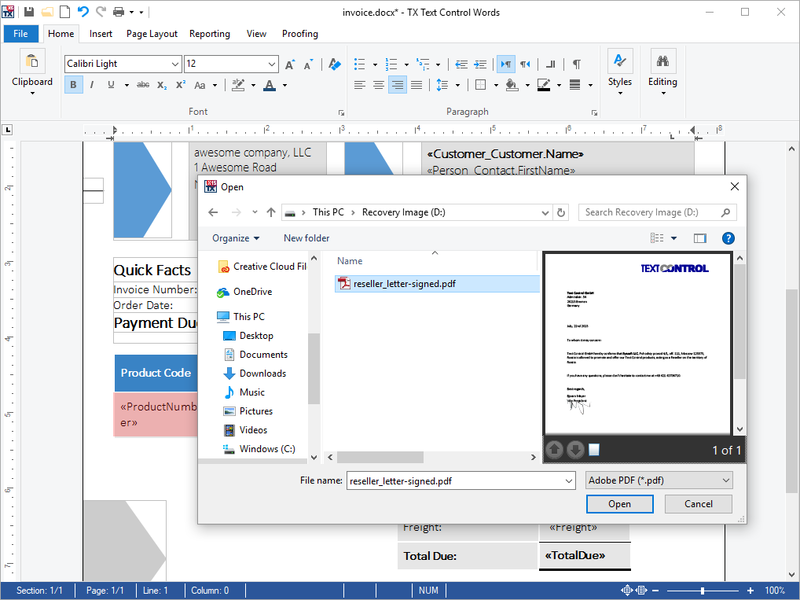 TX Text Control .NET for WPF is used to print documents in batch processes or to create print-ready Adobe PDF documents in any kind of business process and workflow. Text Control Reporting combines the power of a reporting tool and an easy-to-use WYSIWYG word processor - fully programmable and embeddable in your WPF application. TX Text Control .NET for WPF is shipped with it's own WPF Ribbon control and ready-to-use Ribbon tabs for all typical tasks of TX Text Control. Essentially, you can build our demo TX Text Control Words within seconds without writing a single line of code. 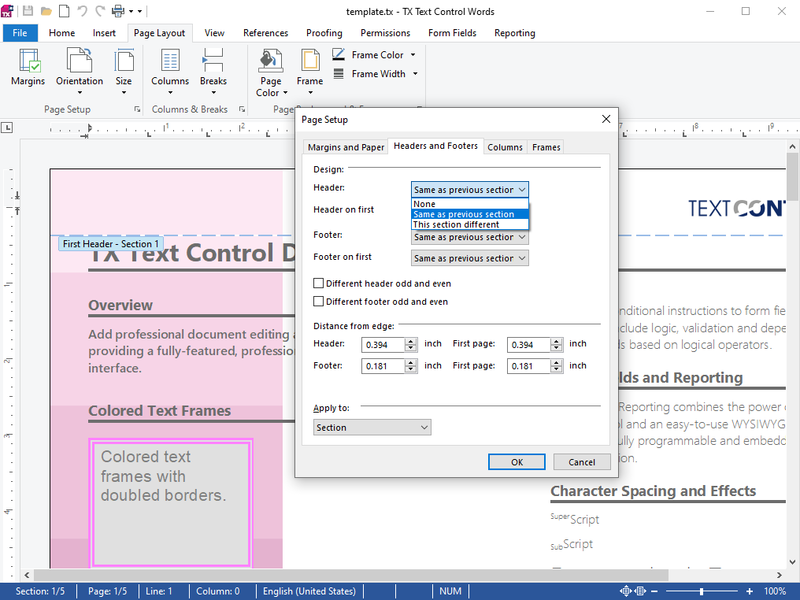 TX Text Control .NET for WPF supports a wide range of word processing formats (RTF, DOC, DOCX, HTML, XML, PDF) and image file formats (GIF, PNG, JPG, BMP, WMF, EMF, TIF). 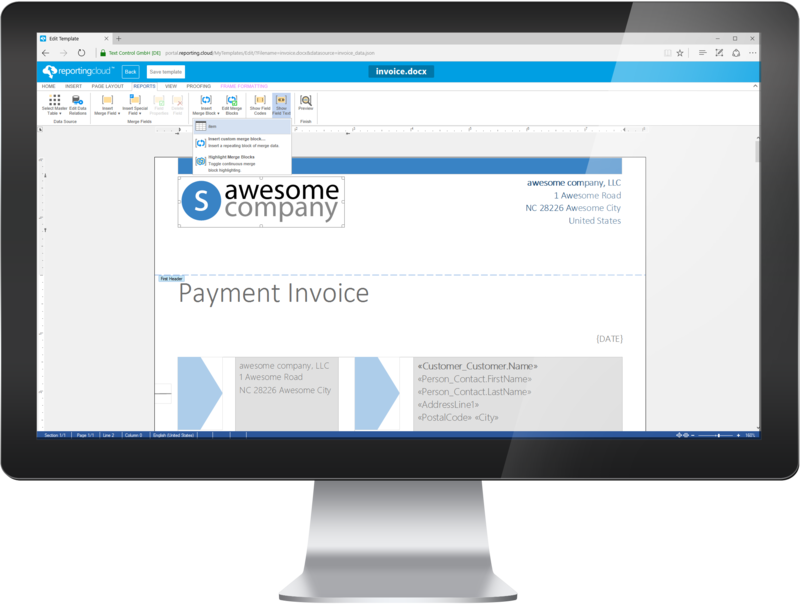 Convert and modify different document types to a standardized style or merge various document types into one unified document. 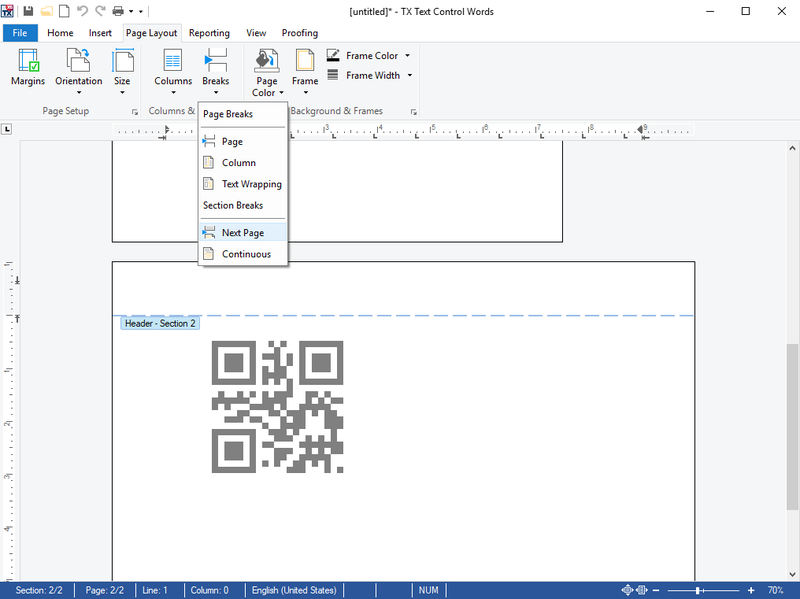 Provide your users an option to modify MS Word documents and to create Adobe PDF documents right in your WPF application. Changes are visually marked in TX Text Control .NET for WPF and also available in the new sidebar Tracked Changes that lists all changes with a timestamp and author information. 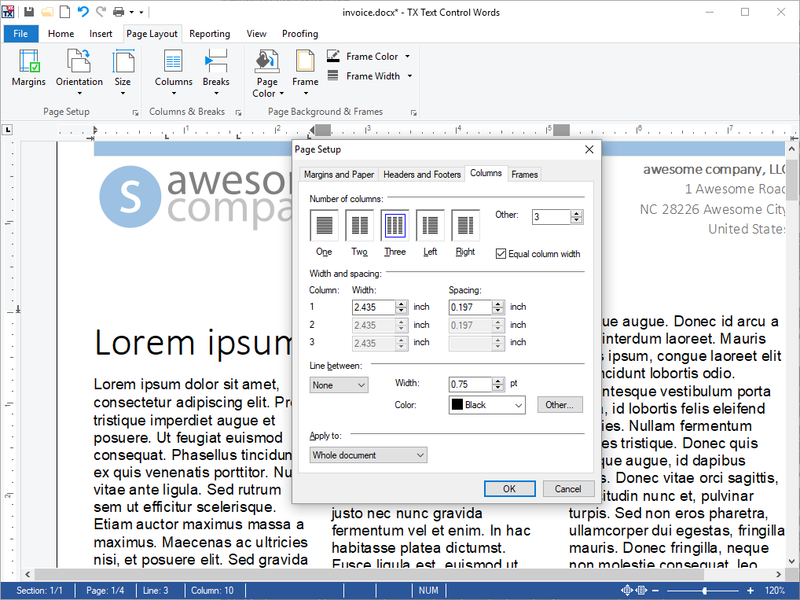 This allows multiple users to collaborate by working on the same document. TX Text Control .NET for WPF supports 100+ formulas, including most mathematical and trigonometric formulas compatible to Microsoft Excel. Typically, a SUM formula is inserted at the end of a table to create a total sum value. The new Reporting ribbon tab is based on the new public class DataSourceManager that encapsulates the complete handling, logic and ready-to-use dialog boxes for the reporting template creation task. 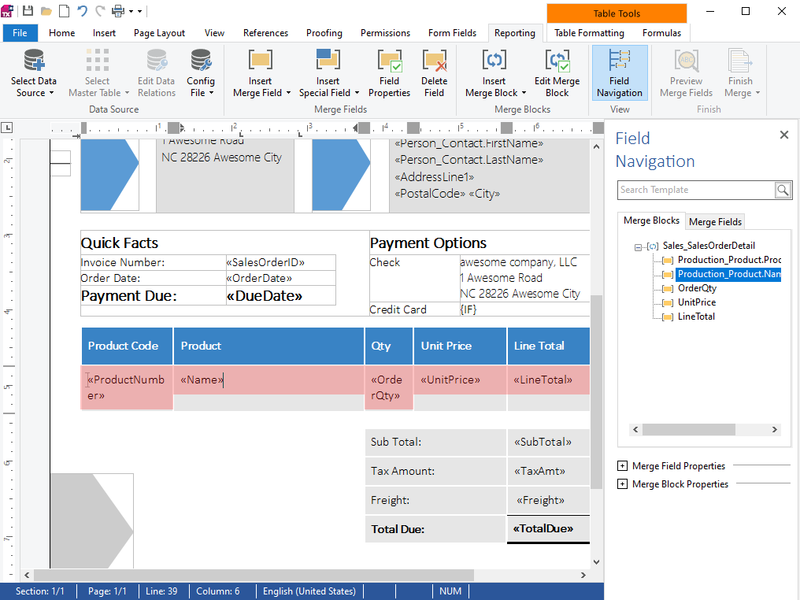 Data sources such as MS SQL, ODBC and ADO.NET can be loaded, the master table can be set and available merge blocks and merge fields can be inserted. 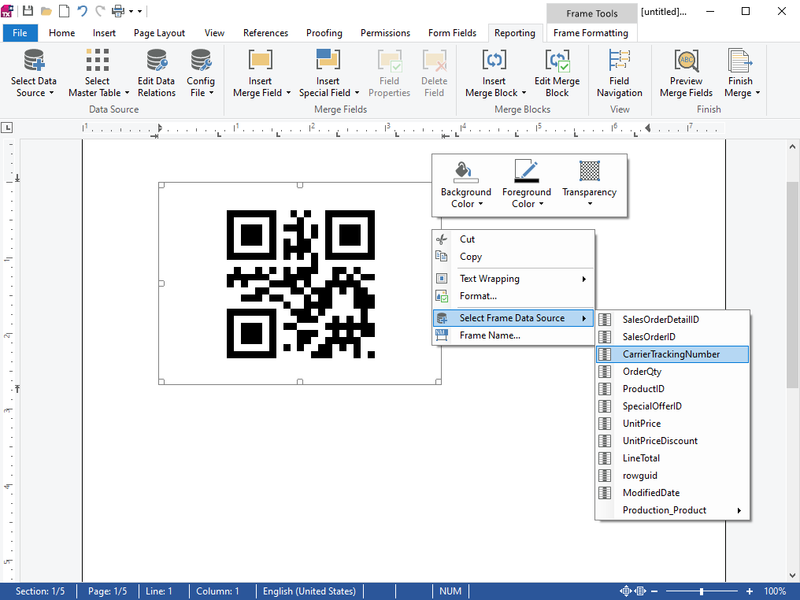 TX Text Control .NET for WPF supports 20 barcode type objects from the optional available product TX Barcode .NET for WPF. 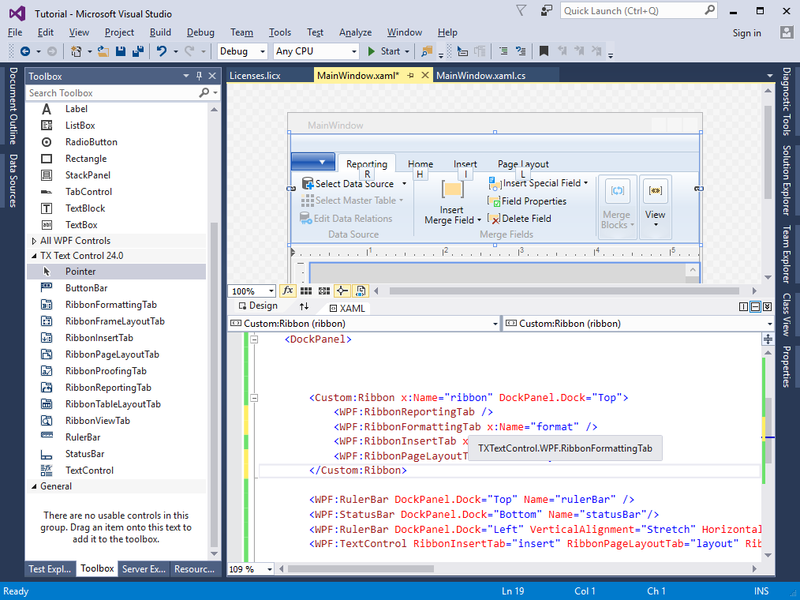 TX Text Control provides designers for all platforms including ASP.NET, Windows Forms and WPF. The functionality is consistent and compatible over the platforms. 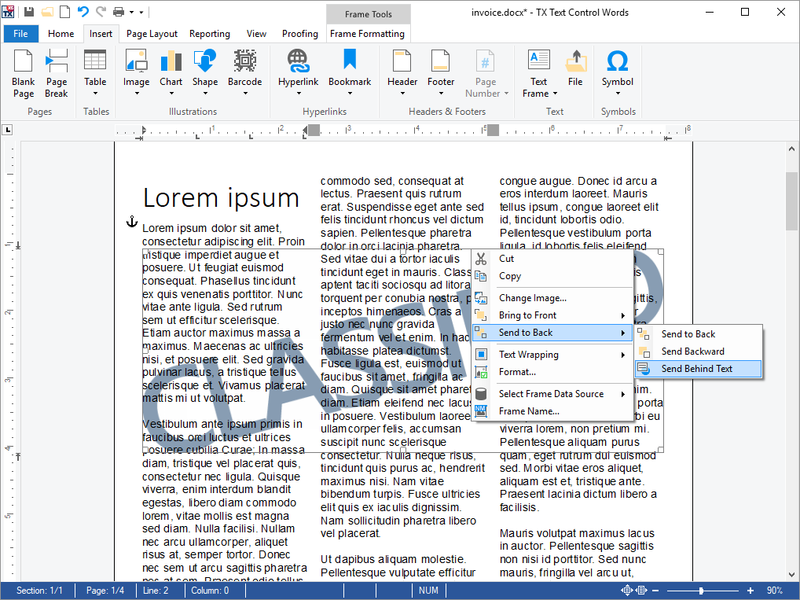 The MS Word compatible editor has the look and feel of MS Word, but can be customized and adapted to user requirements. 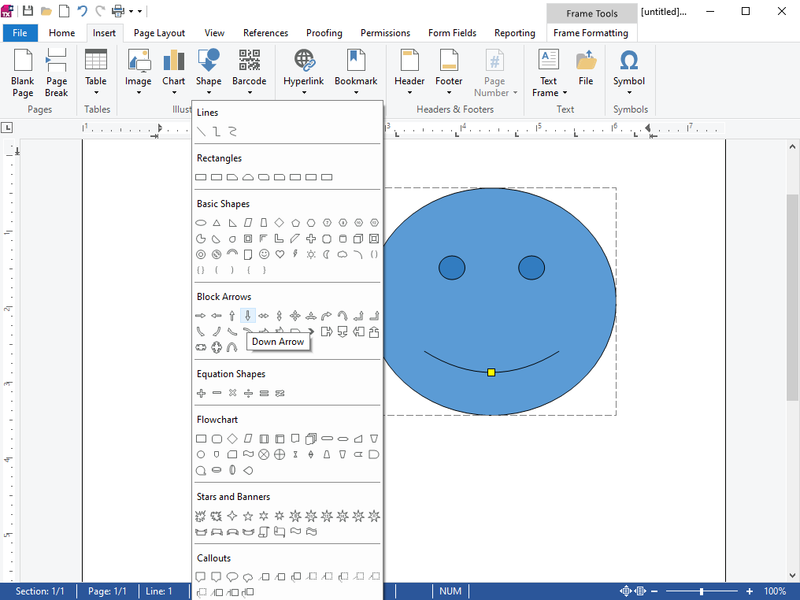 MS Word templates can be reused and edited in TX Text Control. TX Text Control comes with an out-of-the-box editor with a fully-featured Reporting tab that contains the most typical reporting features to load data sources, insert merge fields and repeating, nested merge blocks for master-detail views. After a template has been successfully designed, the reporting engine MailMerge is merging data into the template. 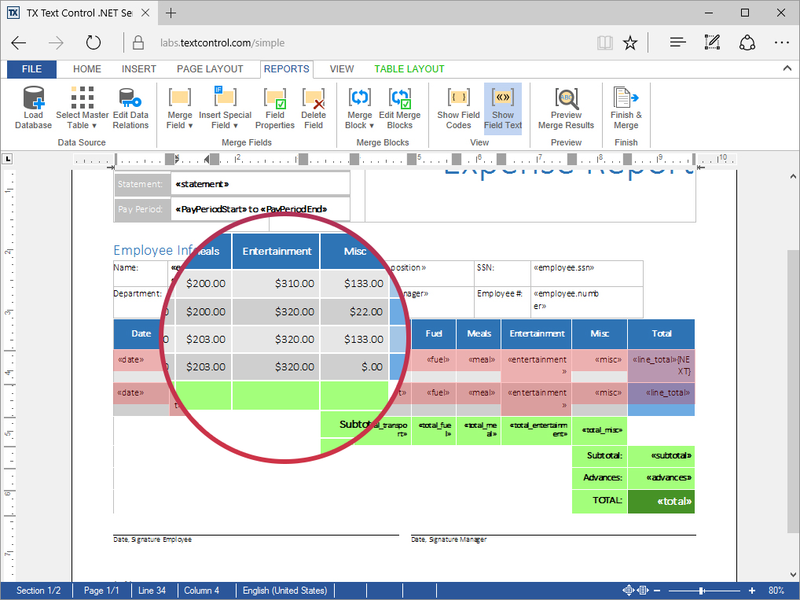 For each data row of the master table in the data source, a document is created. Merge fields are populated with column values and repeating blocks are merged with data rows of related child tables in the data source. In many cases, resulting documents must be shared or presented in the application. All editors of TX Text Control can be used to view documents as well. For ASP.NET, additionally we provide a more light-weight DocumentViewer to render documents in cross-browser compatible applications. 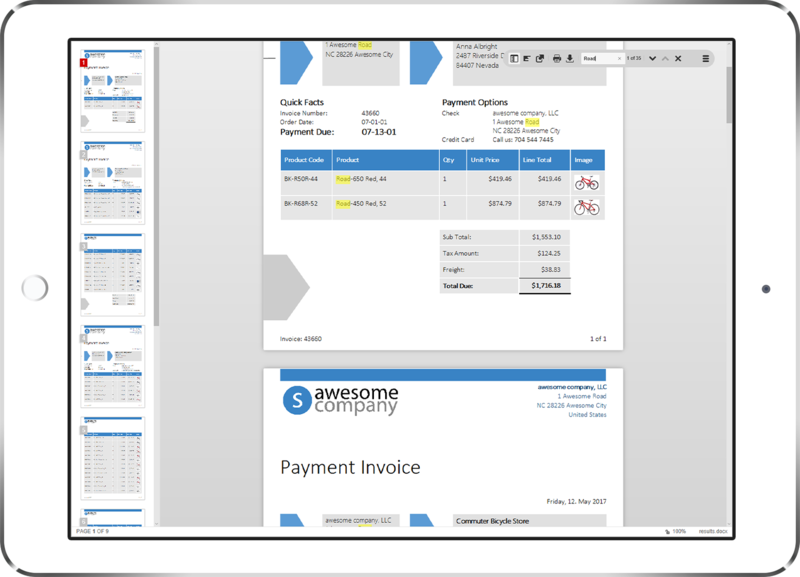 The DocumentViewer is able to render pages in a true WYSIWYG manner, documents are searchable and selectable and it provides a print functionality to print all resulting documents client-side in the browser.